Besides, it is ideal for indoor and outdoor projection with family and friends; it will bring you lots of fun and convenience. It can be easily mounted on the wall or removed from the wall with the double-sided tape and hooks. 1 Projector Screen. With double-sided adhesives and sticking hooks, it is easy to install on the wall or take down from the wall. It can be folded as small as you can, and won't take space, convenient to take with you where you go. Casing & Installation Durable steel casing with plastic ends- White. 110” Diagonal screen size (96 X 54in). Compatible with all projectors (DLP, CRT, LCD, HD, 3D). 3 layer black backed screen which eliminates light penetration and produces top quality color reproduction. 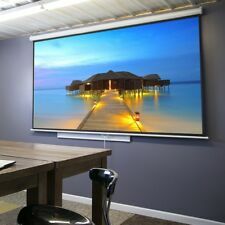 Wall-mounted Projector Screen Hanging For 4K HD Movies Projection. 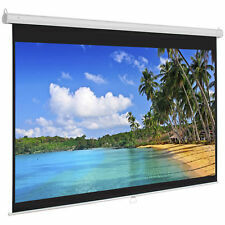 Excelvan 266cmx149cm 120" Diagonal 16:9 1.1 Gain 160°Viewing Angle Portable Fast Install. The Matte White front projection screen with over 160 degree wide viewing angle and 1.1 gain. The overall effect is a superior picture quality that is equipped to handle active 3D and 4K projector resolutions. Include projection screen 1, steel tripod 1 and instruction manual 1. Fold:Screen 92.5"(L)x 3.9"(W)x 2.8"(H),Tripod 61.8"(L)x 2.4"(W). This Tripod Projector Screen is an affordable solution for professional or personal projection needs. 【PORTABLE PROJECTION SCREEN STAND】 Aluminum tripod legs provide a stable base during use, and will fold up for easy portability and storage. May have slight blemishes or stubborn folds but should generally be OK for projection. 3D Printing Moon Lamp USB LED Night Lunar Light Touch Color Changing Wood Stand. 1500mW High Speed Bluetooth 4.0 USB Laser Engraver DIY Engraving Printer Machine. May have slight blemishes or stubborn folds but should generally be OK for projection. 600ml Electric Water Jet Pick Flosser Oral Irrigator Teeth Cleaner Tooth Cleaner. 1 ×120" Flex projector Screen. 2PCS 22CH FLOUREON Long Range Walkie Talkie Two-Way Radio Set Orange 462-467MHz. 3D TV Glasses&Accessories. I t adopted with superior quality 1.2 gain matte white surface material which can diffuse projected light in all directions, so it has a wide viewing angle over 160 d egrees, and can achieve 1080P full HD crystal clear image video projection. This screen features real projection screen material, not a sheet. The material is stretchy multi-layered vinyl made specifically for watching projected movies. Even after mounting on the wall the screen can be horizontally adjusted to ensure perfect positioning! 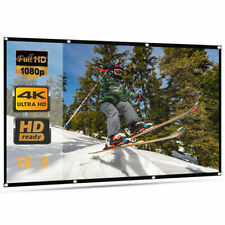 High quality matte white surface provides 80" x 45" of viewing area with 16:9 aspect ratio. It features high quality matte white viewing surface, which diffuses projected light evenly. 1 x 92" 16:9 Motorized Projector Screen. •FRONT & REAR PROJECTION - This simple projector screen is designed with suitable thickness for not only front projection but also rear projection. Made with natural Polyester fabric that The projection is sharper and brighter than most other projection screens, The Projection Screen are thicken and smooth, no wrinkle when folded / crushed.